We are the noteworthy manufacturer and supplier of Tyre Steel Wire Scrap. This range is manufactured by our certified vendors using supreme class steel in line with international standards to ensure flawlessness at the users’ end. The offered range is available in different specifications to meet varied needs of our clients. We are ranked amongst the trusted firms engaged in providing a wide range of Steel Wire Scrap. Pioneer in the industry, we are engaged in manufacturing an impeccable range of Tyre Bead Steel Wire. Our entity is providing Tyre Steel Wire Scrap. We provide this product as per worldwide industry norms. In addition, our offered products can be easily availed in numerous specifications at reasonable rates. We are assisted by a crew of experienced personnel who are enormously indulged in bringing forth a top class Steel Tyre Wire Scrap. These scraps are provided to our customers at very reasonable rates. Vardhaman Pyro Fuels India Pvt. Ltd.
We are offering to our client a high quality of iron scrap. It has high iron content and is free from impurities. These are known for their features like heat resistant and anti corrosion and are available at industrial leading prices. Owing to the years of industrial experience, we have been able to serve our valued clients with a wide range of Tyre Steel Wire Scrap. 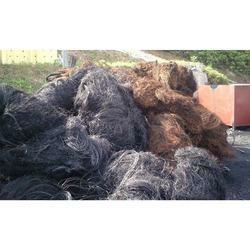 we have steel wire scrap from tyre pyrolysis plant. Steelcord is a steel wire used as a single element in wobblers or in a cord. It is used to reinforce tyres, thanking to its mechanical properties, such as breaking strength, lengthening, high resistance to tension and compression.